Qua Ibo (40% WI and technical partner; NEPN, an indigenous company, 60% WI and operator) is located at the mouth of the Qua Iboe River in the eastern Niger Delta and covers an area of 14 km² (3,459 acres). The License is immediately adjacent to the ExxonMobil Qua Iboe Terminal. 5 wells have been drilled: Qua Ibo-1, Qua Ibo-2, Qua Ibo-3, Qua Ibo-4 and one side track (Qua Ibo-3ST1) . 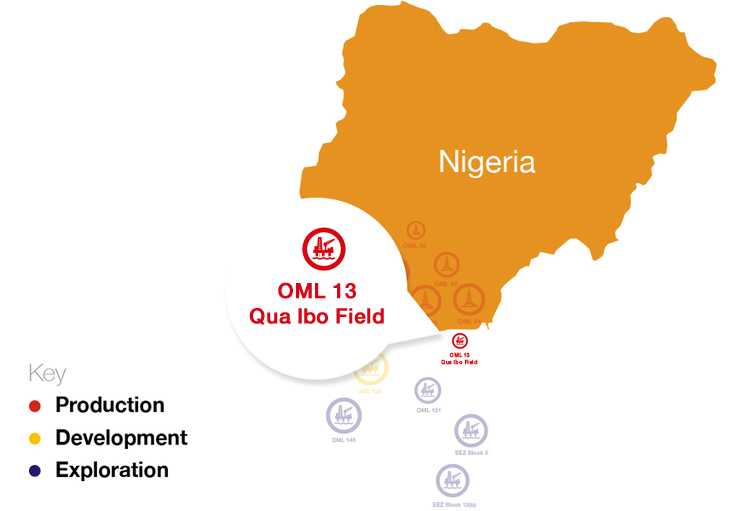 OML 13 contains a blend of light and heavy sweet crude oil (typically 41° to 45° API) and natural gas.